The directions below apply to bantams and mature poultry of similar size, unless otherwise noted. For larger or smaller birds, change the dosage in proportion to the size of the bird. Use VETRx warm, unless otherwise specified. To warm, place the spout in an open position. Put the bottle in a small pan of water. Heat at medium temperature. Always test the temperature of the product before applying internally or externally. To prepare the solution, add one (1) teaspoonful of warm VETRx to one (1) cup of very warm water. VETRx mixes with hot water, but floats on top of cold water. Colds and Roup: Symptoms of colds are watery eyes, droopy appearance, and an unusual tendency to shake or turn the head. To treat colds, drip VETRx solution into the bird's nostrils. 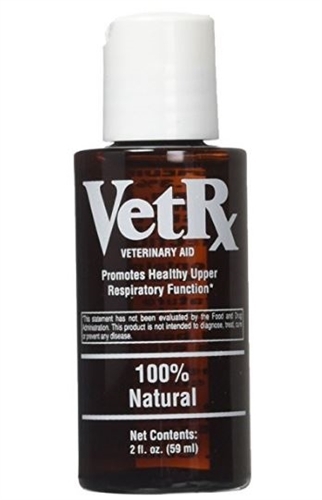 Place a few drops of warm VETRx, straight from the bottle, down the throat of the infected bird at night. Also, rub some warm VETRx from the bottle over the head of birds and under wings. If a cold develops into more severe roup, change to a stronger solution of one (1) teaspoonful of VETRx in one-half (1/2) cup of hot water. Treat the same as for colds. Also, swab the throat and wash the head and eyes with the stronger solution four (4) or five (5) times a day. Keep the nostrils, eyes, and throat as clean as possible. Flock Care: If colds infect many in a flock, spray warm VETRx solution over as many birds as possible. Use any small sprayer, and keep the sprayer in a pan of hot water before using. For birds in a flock which look droopy, rub warm VETRx, full strength, over their heads, eyes, and under their wings. Also, provide plenty of clean, cool drinking water for the flock. Add a few drops of VETRx to the drinking water each time it is changed. It will float on the water and get on the beaks and nostrils of the birds each time they drink. Vaporizer: If deciding to use a vaporizer, make certain that it is a hot water model. Follow the manufacturer's directions. Fill the cup with VETRx full strength and operate the vaporizer for at least one (1) hour while birds are roosting. Preventing Colds and Roup: To help prevent colds, sprinkle a few drops of VETRx in the litter every four (4) or five (5) days. Add a few drips to the drinking water every time it is changed. Rub one (1) or two (2) drops of warm, full-strength VETRx under the wings. For Show Birds: To protect birds from colds while traveling to and from shows, place a few drops of warm VETRx under one (1) wing. It does not stain, or harm feathers, wing, or color. Rubbing VETRx on the legs brings out the true color and helps to protect them from mites and lice. When the birds return from shows, keep them separated from the flock for one (1) week. Wash their feet and heads with a warm solution, and rub warm VETRx from the bottle on the heads and under wings. Scaly Legs: When shanks of the bird appear dry, rub them with a small amount of cold VETRx from the bottle. In cases of heavy scale, apply cold VETRx and rub in thoroughly all over the shanks and toes. Repeat every three (3) days until the legs are completely free of scale. "Eye Worm": The tiny worm works its way under the third eyelid and causes a pus pocket to form. The bird will blink excessively and rub its eye at the base of the wing feather. To treat, hold the bird under one (1) arm so that both hands are free. Open the bird's mouth while turning its head to the side and tilting down to the cleft in the roof of the mouth can be seen. Dip a small cotton swab into warm VETRx. Press the swab right into the cleft. Do this slowly. Watch for VETRx to come from each side of the bird's beak and pus coming from the corner of each eye. Remove the pus and rest the bird for awhile. The treatment may have to be repeated two (2) or three (3) times before results are seen. Tonic Feeder for Breeding: To keep breeding birds healthy for maximum production of breeding eggs. Keep three (3) quarts of laying mash indoors for a few hours until it reaches room temperature. Warm a bottle of VETRx. Pour the entire bottle onto the mash and mix well by rubbing the mash between the hands. Let it stand in a warm room over night. Next day, put the treated mash in a container with a tight lid and let it stand for about two (2) weeks. Mix one (1) tablespoon of treated mash, once a day, in feed for every 20 birds. If feeding 10 birds or less, one (1) teaspoon is enough. Be sure to stir the treated mash thoroughly into feed. Made with 3.3% (v-v) alcohol U.S.P. The mixture contains Canada balsam, camphor, oil origanum, oil rosemary, blended in a corn oil base. While treating poultry and other birds, follow the usual precautions. Isolate infected birds as soon as possible. Clean out all coops lofts in which sick birds have been. Keep the birds as clean and dry as possible, and free from drafts. Watch for evidences of disease in birds coming home from shows. Diseases are often contracted in baskets. If symptoms persist consult a veterinarian.